The Honda VFR is one of the best sport touring motorcycles ever made. I think every motorcycle magazine in the world has named it "Motorcycle of the Year" at some point. Because it's such a great all-around mount, VFR riders tend to rack up the miles. Obviously, these proud riders want to keep the Big Red machine protected and looking good. The Honda VFR800 VTEC Motorcycle Fenda Extenda is a nice add-on that does just that. The function of the Fenda Extenda (I guess they have something against the letter R) is to protect the bodywork and frontal engine components from stray rocks and road debris. One of the most vulnerable components needing protection behind the front wheel is the radiator. 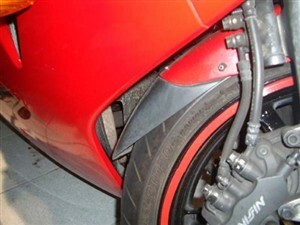 The Fenda Extenda serves this protective function, as the name hints, by extending the front fender a few inches. It is not visually obtrusive in that it is a subtle matte black. If you are looking for a little flair, I have also seen it offered in Carbon Fibre. If you are going to rack up the miles on your VFR, this is a nice add-on. It fits well and is functional. Installation of this item would be measured in minutes, not hours. I guess you could say it is a great "radiata protecta"!